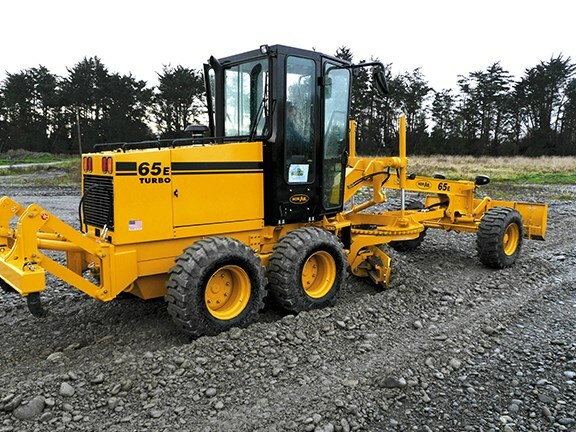 The NorAm 65E grader brings versatility to a job site. The high-set brake pedal is one of the few negatives of the NorAm 65E grader. It’s unusual to find something actually built in the United States these days, so RANDOLPH COVICH had to take a look at NorAm’s compact grader. NorAm can trace its family lineage back to the Fiat-Allis grader range. My understanding is that the business was set up in the early 1990s by two former senior managers of Fiat-Allis, North America, to market the Fiat-Allis 65B compact motor grader throughout the US, under the rebranded name of NorAm (North America). In 2004, the manufacturing rights were purchased by NorAm’s manufacturing partner and the NorAm 65E grader morphed into existence. The new model featured increased horsepower and ZF transmission with electronic shift control, along with other improvements, all aimed at enhancing production and maximising resale value. It appears NorAm found a nice little niche in the market and has now surpassed 17,000 graders sold to date. 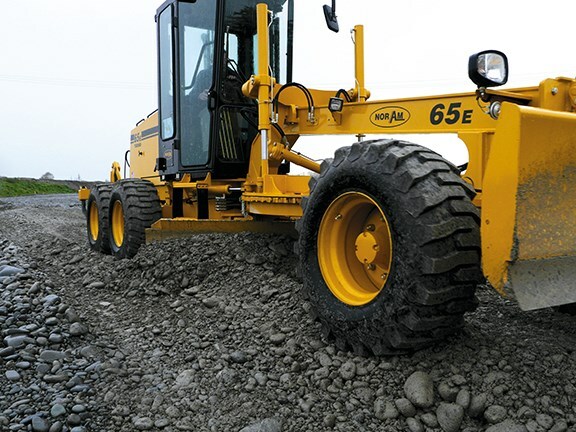 In the case of compact motor graders, the challenge for the manufacturer is finding the right balance between features customers expect on large graders while maintaining a compact, cost-effective design. From what I see, therein lies the NorAm 65E’s strength and the foundation for its success as a compact grader of choice in the North American market over many years. Tipping the scales at 8.25 tonnes, the NorAm 65E can probably be best described as a multi-purpose grader primarily suited to small to medium jobs. But that’s not to say the machine can’t tackle something bigger if the situation arises. With an overall length of 6.6m, the grader’s compact size and weight should allow it to be moved on most company-owned transporters, negating the need for a specialist transportation company. This should enable greater job flexibility. Actually, a walk-around of the NorAm 65E reveals the results of the robust original design that must get continually tweaked to keep it up to date with the changing face of construction equipment technology. Wear and tear has been heavily factored in with components, such as control linkages being manufactured with replaceable bushes, and shim plates fitted to the mouldboard (blade). With components such as these taking the brunt of the wear, expensive repairs can be minimised with regular maintenance of these cheap replacement parts. Our test machine was powered by a turbocharged Cummins QSB4.5 Tier 3, four-cylinder diesel engine that delivers 82kW (110hp) at 2200 rpm. I believe the Caterpillar C4.4 Tier 3 engine can also be specified as an alternative powerplant. The powershift transmission features electronic shift control and its six-speed gearing allows a top travel speed of 38.4 km/h. An LCD ‘message centre’ lets the operator know what gear has been selected, and a gauge keeps tabs on the transmission temperature. Stopping power is provided by the four-wheel wet disc system and these self-adjust. The parking brake is mechanical. The 1.3m-diameter, gear-driven circle is supported by an ‘A’ frame that allows 360-degree rotation. This section of the NorAm 65E is where it steps beyond some of its other competitors, by enabling placement of the mouldboard in multiple positions, including giving it the ability to cut a batter alongside the machine — something that, up until now, has been reserved for the more expensive grader brands. With a width of 3050mm, the cutting edges of the mouldboard are replaceable, the end bits are interchangeable, and it has adjustable mouldboard wear strips. Luckily for me, our test area was tucked out of harm’s way in a new housing subdivision under construction. Now, I would be a fool to tell you I am a competent grader operator, so I kept to a few basic movements to get a feel for placement of the controls and to see if the blade could be clearly seen from inside the cab. The decent-sized work-pad allowed some good passes to be made and gave the opportunity to windrow material, while also trying out the articulation of the NorAm 65E. Using this feature when executing turns cuts the turning circle of the machine down to what seemed no more than a few feet. When working in grading mode, and by using combinations of the machine’s different features, it became obvious to me that versatility is what this machine brings to a job site. The optional dozer blade fitted to the test machine makes it ideal for car park construction work and gives the machine the ability to grade close alongside manholes and into other tight spots. I did find it difficult to see the cutting edge at times, but I put this mainly down to limited operating skills and my inability to ‘feel’ what the mouldboard was doing as it cut a path through the gravel. Deciding to get the opinion of a more experienced operator, I located Sam Rihari. Having spent some time behind the wheel of the NorAm 65E, like me, Rihari found the machine operated well and had an excellent amount of power available. There was, however, one redesign that Rihari would require to be done if he was to operate the grader on a full-time basis — the replacement of the brake pedals. In their current configuration the operator needs to hold his or her foot off the pedal, often for extended periods of time. 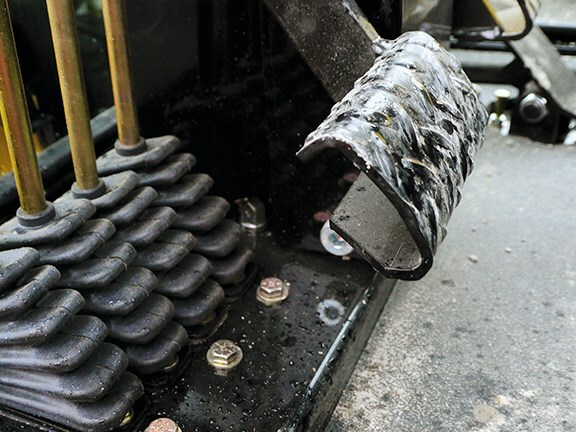 If these were changed so the operator’s heel could rest on the floor, then this would reduce fatigue and provide better balance for a standing operator. To change this would be a relatively easy task, but you would need to be careful any warranties were not voided. So, our initial field demonstration provided very positive feedback with everyone pleasantly surprised at the power to the wheels and the versatility of the unit. The NorAm 65E is a quality machine. It performs very well, and it seems the grading tasks it can carry out are only limited by the ability of the operator. With the machine’s configuration and its ability to work fairly comfortably in tight situations, I would say the NorAm 65E would be suited for both urban and rural job sites. The operator is not forgotten either, with a large, sound-suppressed, ROPS-certified cabin with air conditioning, air suspension seat, full lighting package and roading mirrors being standard. Click here to find motor graders for sale. Click here to look up motor grader specifications.